The board has announced the results today at 3 pm on the official website. The information and result is also available below for your ease. We have mentioned a simple procedure by following, you can get your performance card without any problem. 1.0.1 How to get ICSE Class 10th & ISC Class 12th Results 2016 using SMS? The exams for class 10 and 12 were conducted by CISCE in the month of February and March 2016. As per the statistics, a total number of 1,58,833 students had appeared for the examination which included 88,209 boys and rest girls. Compared to last year, the results for this year have been declared about two weeks earlier. It has been possible due the work of Orion Indian Systems Pvt. Ltd. as they have developed a new technology, Live Ink Character Recognition (LICR). LICR helped in reducing the time required for the compilation of result as it captures and digitalizes the marks given on the top of the answer sheets. After that, it instantly transfers and encrypts the captured date to the cloud servers of the council directly from the evaluation centers. Gerry Arathoon, the CEO and secretary of the council stated that the board is the board is the first to use this technology in the world. 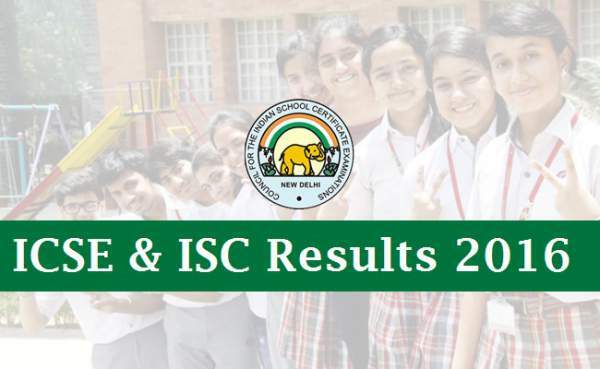 How to get ICSE Class 10th & ISC Class 12th Results 2016 using SMS? The students can also receive their ICSE and ISC results for class 10 and 12 respectively by sending an SMS. All they require to do is to send a message to the number 09248082883. To get the result, type “ICSE 1234567” where 1234567 is the unique ID number of particular student. Type and send it to the number mentioned above. The similar steps can be taken for the ISC board. Type “ISC 1234567” where 1234567 is the unique 7 digit ID and send it also to the same number mentioned above. In just a matter of minutes, the CISCE will send back you a message with your results in the following format. RAHUL SHARMA ENG-97, HIN-94, HCG-90, MAT-94, SCI-90, CTA-100, SUPW-A, PCA. Below, there are a few steps which you can follow to eheck your results online. First of all visit the official web portal. Look for the results tab. Choose your board – ICSE or ISC and click on it. Enter the asked information like unique ID and captcha, etc. Then, click on Show Result button. The team at TheReporterTimes wishes all the candidates all the very best for your result and future tasks. All of you may get your desired career streams. And for those who aren’t able to clear or qualify the examination according to their desires, they can re-appear as the council gives another chance for the same.